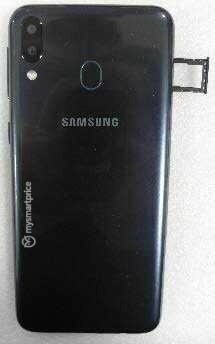 Samsung is billed to release its new Galaxy M phones on January 28. Images and more concrete details of the device have now been revealed, with touted pricing information giving the impression of devices offering excellent value for money. Samsung relinquished its dominance over the India market to Xiaomi last year, and the company is set to attempt to retake its position, as it plans on expanding its smartphone offerings for that market. The South Korean company recently released its Exynos 7904 SoC, aimed at the Indian market, and will unveil a new series of phones too later this month. The company will unveil a new Galaxy M series on January 28, with the line expected to set sail with the launches of the M10 and M20 budget devices. There have also been rumors claiming the existence of an M30. The M10 is expected to feature a 6.2-inch HD+ display, Exynos 7872 SoC, 3 GB of RAM, 32 GB of storage, 13 MP (f/1.9) + 5 MP (f/2.2) dual rear cameras, 5 MP selfie shooter, and a 3400 mAh battery. The M20 is expected to sport a 6.3-inch FHD+ display, 3 GB of RAM, 32/64 GB of storage, Exynos 7885 SoC, 13 MP (f/1.9) + 5 MP (f/2.2) dual rear cameras, and a huge 5000 mAh battery. Both devices will sport Samsung's Infinity-V display, which is a waterdrop notch, basically. They will also both run on Android 8.1 Oreo out of the box, and feature Micro USB ports. Both devices are expected to house fingerprint readers on their rears. The M10 is said to come with an MSRP of Rs 8,990, with the Galaxy M20 starting at Rs 12,990, which translates into US$125 and US$180 respectively. Very competitive pricing by Samsung.